If you were to ask a Thai person what is the national Thai dish? The answer is probably not pad Thai but Mackerel with Chili Sauce! This the dish that defines Thai food and Thai culture for Thai people. 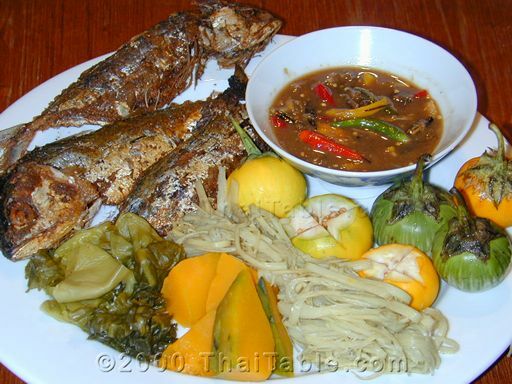 Mackerel with Chili Sauce is one of the most common Thai dishes that Thai people eat in their homes and is, in stature, equivalent to meatloaf in the US. It is a simple peasant food that you rarely find in restaurants. This dish has one very exotic ingredient: waterbugs. While I think the dish stands on its own without the waterbugs, my husband does not get too excited about the bugless version. He loves it with the waterbugs. I do not recommend substituting the large US eggplants for the small Thai ones. There is too much of a difference in texture. There are several versions of the chili sauce. Some households add ground dried shrimp, pea eggplants, Thai eggplant and/or ma uug (similar to Thai eggplant, yellow, round with fur). Some people swear by palm sugar instead of cane sugar. 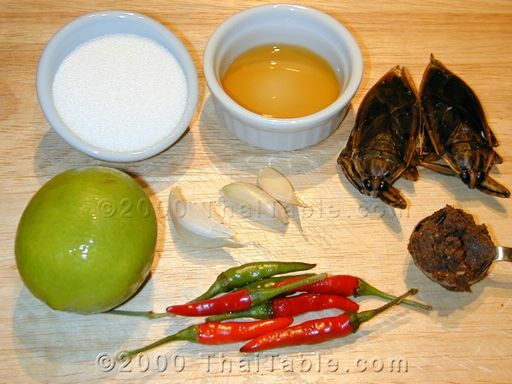 The basic ingredients are still the ones listed here: shrimp paste, garlic, peppers, sugar, fish sauce and lime juice. 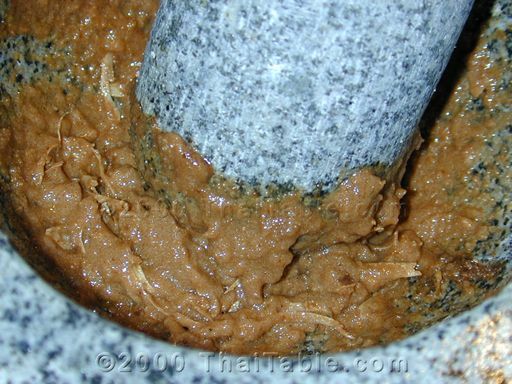 In a mortar, pound shrimp paste, sugar and garlic until it is well mixed. Add fish sauce, lime juice and other optional ingredients. 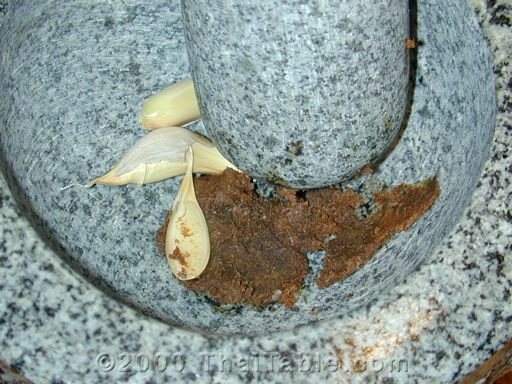 If you plan to add the optional eggplant, crush it a little bit in the mortar. Lightly crush the chili peppers in the mortar. Use as many or as few peppers as you like. If you like it hot, smash the chili peppers into small pieces. If you don't like it hot, just put the chili in the bowl directly, for garnish. Mix everything well. You should have the eggplant and chili peppers floating in the sauce. 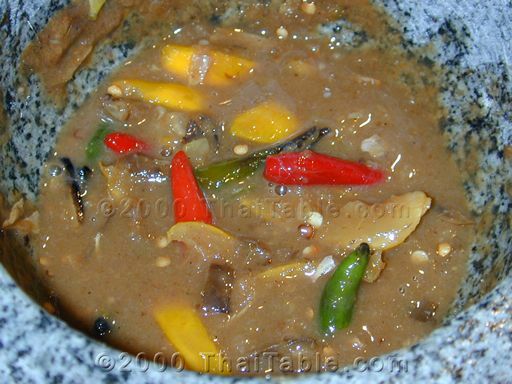 Many Thais add water bug in their Nam Prig sauce for its exotic scent. There is an artificial water bug scent that you can buy so that you can have the flavor without actually having the bugs. If you feel wild and exotic try the water bug or the scent. If you can find the water bugs, just heat up (in a microwave or over the flame) the bugs for a minute, remove the wings and the front of the heads and cut up the water bugs in small pieces and pound them before adding the fish sauce and lime juice. Serve with pan-fried mackerel and fresh or cooked vegetables. The most common vegetables served with the sauce are cucumber, string bean, Thai eggplant, regular eggplant dipped in egg and pan fried, bamboo shoots and lotus stem. Any vegetables are great. How to eat this: take a small piece of mackerel, and a piece of vegetable, drop a half teaspoon of sauce on top, scoop it all up with rice. Put in your mouth and chew. YUM!